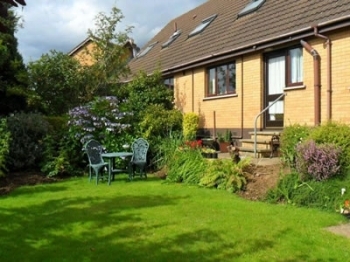 Belfor Self Catering is in the quiet residential area of Old Mill Heights, Dundonald, Belfast. The well equipped accommodation sleeps 5 people in three bedrooms---a double en suite shower room downstairs and a twin bed room and single bedroom upstairs along with a bathroom. There is a television lounge, a dining kitchen and a utility room. The Belfast metro bus service, route 4b is nearby and Ulsterbus serves the Ards Peninsula on the A20 dual carriageway. There is off street parking and a secluded rear garden for guest use. Belfor is convenient to the George Best and Aldergrove airports, Belfast harbour and the Larne harbour. This accommodation is very convenient as a base for touring Northern Ireland and in the past guests have stayed here while visiting relatives, attending weddings, concerts and other events.